The Babylonians worshipped the god 'Bel'. The Syrians called this god 'Baal' and, like the Egyptian goddesses Hathor Isis and Bat, was associated with bull worshipping. The sacred meaning of Baal has been lost in the mist of history, hence the Babylonian confusion (Tower of Babel). The Greek rendition of the word Babel translates not only into 'Confusion but also into the 'Gate of Bel', the gate of the god Bel. In Hebrew, 'Ba-el' means "Gate of God." All of these gods and goddesses were associated with a bull myth and represented Taurus around the time the Vernal Equinox Sun was in the Silver Gate in 4468 BC. 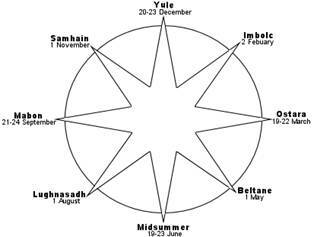 The Celtic druid Beltaine festival probably has its origins in the celebration of the rebirth of the Babylonian God Bel (as in "Beltain") at the Vernal Equinox in 4468 BC. Beltaine was a cross quarter day celebrated on the first of May when huge bonfires were lit on holy hills to celebrate the start of the summer season. By the time druids celebrated Beltaine, the original celebration date and its Babylonian sacred origins and significance (Great Celestial Conjunction) was lost in the Babylonian confusion. At the first of November, the start of the winter season was celebrated by the druids and this festival was called "Samhain." Neo-pagans, known as "Wiccan," later adopted the Beltaine festival. They celebrated the death and rebirth of their horned God, mentioned by many occultists such as Eliphas Levi, by the name "Baphomet." The horned God echoes the original veneration of the horns of the bull by the Sumerians, Babylonians and Egyptians, but the exact significance of the horns (as in the Isis mythology) and their symbolic reference to the birthplace of the Sun, was lost. The origins of the eight-pointed cross and its solar significance, however, must be dated back to the Sumerians and Babylonians, who worshipped the Sun God 'Utu' (Sumerian) or 'Shamash' (Babylonian). The symbol of Utu/Shamash was an eight-pointed cross . This eight-pointed cross was composed of two superimposed four-pointed crossed of what the authors believe to be a symbol of the Great Celestial Conjunction. Herschel explains on his website that the vision of Ezekiel recounted in the Old Testament is in fact the recount of an ancient visitation from space. Herschel is in good company with this hypothesis; many authors before him have suggested exactly the same thing. In fact it makes perfect sense since Ezekiel in his vision did see a wheel within a wheel coming down from the sky out of a whirlwind surrounded by fire. In addition the wheel had portals (eyes) around the wheel suggestion strongly that it could be a UFO. Ezekiel 1:18 (KJ version) 18As for their rings, they were so high that they were dreadful; and their rings [were] full of eyes round about them four. The alien visitation explanation for Ezekiel’s vision falls short, however, when one takes the astrological connotations of Ezekiel’s vision into account. The eyes around the wheel are not portals of a UFO but the constellations along the zodiac. First of all, Ezekiel’s vision happens on the bank of a river. While Herschel has failed to recognise the importance of the river in all of his star maps except for his initial discovery of the astrological meaning of the pyramids along the Nile, the reader of this article will by now be alarmed that the river in Ezekiel’s vision may in fact be a metaphor for the Milky Way. Ezekiel 1:3 (KJ Version) 3The word of the LORD came expressly unto Ezekiel the priest, the son of Buzi, in the land of the Chaldeans by the river Chebar; and the hand of the LORD was there upon him. Ezekiel explains that he saw four winged creatures with four faces each in his vision. They had the overall appearance of a human but they had the feet of a calf. Ezekiel 1:7 (KJ Version) 7And their feet [were] straight feet; and the sole of their feet [was] like the sole of a calf's foot: and they sparkled like the colour of burnished brass. Ezekiel 1:10 (KJ Version) 10As for the likeness of their faces, they four had the face of a man, and the face of a lion, on the right side: and they four had the face of an ox on the left side; they four also had the face of an eagle. These four faces are the four fixed signs of the zodiac, the face of a man (Aquarius), the face of a lion (Leo), the face of an ox (Taurus) and the face of an eagle (Aquila). 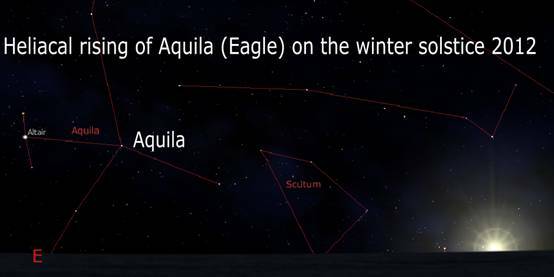 Aquila is a constellation very close to Scorpio. Hence, the four faces of the four creatures in Ezekiel’s vision represent the so-called fixed signs of the zodiac (Leo, Taurus, Aquarius, Scorpio) that form a perfect four-pointed cross. 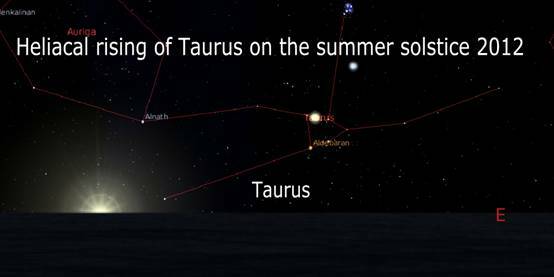 During a Great Celestial Conjunction when the Sun is on the Milky Way at the equinoxes and/or solstices, these four zodiac signs rise heliacally, meaning before the Sun. This is why the ancient fixed signs of the zodiac denote the Galactic Cross! Ezekiel 1:1 (KJ Version) 1Now it came to pass in the thirtieth year, in the fourth [month], in the fifth [day] of the month, as I [was] among the captives by the river of Chebar, [that] the heavens were opened, and I saw visions of God. Each zodiac sign spans 30° (thirtieth year) of the 360° of the zodiac. The Leo-Taurus-Aquarius-Scorpio cross in the zodiac divides the 12 signs in four groups of three (4th month) while the ecliptic Milky Way crossing itself occurs in 5° of the appropriate signs (fifth [day] of the month= +/- 30 days). Notice that he mentions the river (Milky Way) in the same sentence! Ezekiel 1:16 (KJ Version) 16The appearance of the wheels and their work [was] like unto the colour of a beryl: and they four had one likeness: and their appearance and their work [was] as it were a wheel in the middle of a wheel. Suppose the wheel had four spokes (corresponding with the four faces of the creatures), than the wheel within a wheel could be referring to the superposition of two four-pointed crosses! More importantly, these are two separate four-pointed crosses since he’s referring to two wheels! One of these wheels was linked to the Earth! Ezekiel 1:15 (KJ Version) 15Now as I beheld the living creatures, behold one wheel upon the earth by the living creatures, with his four faces. Ezekiel 1:19 (KJ Version) 19And when the living creatures went, the wheels went by them: and when the living creatures were lifted up from the earth, the wheels were lifted up. It’s important to realize that there were four creatures each with the faces representing the fixed signs of the zodiac. These four creatures esoterically represent the four Great Celestial Conjunctions that occur within a Great Year when one of the wheels turns (Earth Cross) while the other is fixed (Galactic Cross). Exactly four times do the four spokes of the wheels overlap when the wheel within a wheel spins, and these moments thus represent the four Great Celestial Conjunctions. Finally, Ezekiel spots God in the firmament. He appears in a bow in a cloud. The Milky Way is a bow that straddles the night sky from North to South. It was known to the ancients as either that great River in the sky or the big white cloud of the night sky. Ezekiel 1:20 (KJ Version) 28As the appearance of the bow that is in the cloud in the day of rain, so [was] the appearance of the brightness round about. This [was] the appearance of the likeness of the glory of the LORD. And when I saw [it], I fell upon my face, and I heard a voice of one that spake. Revelation 4:6-8 (KJ Version) 6And before the throne [there was] a sea of glass like unto crystal: and in the midst of the throne, and round about the throne, [were] four beasts full of eyes before and behind. 7And the first beast [was] like a lion, and the second beast like a calf, and the third beast had a face as a man, and the fourth beast [was] like a flying eagle. 8And the four beasts had each of them six wings about [him]; and [they were] full of eyes within: and they rest not day and night, saying, Holy, holy, holy, Lord God Almighty, which was, and is, and is to come. This time the four beasts of the Apocalypse are associated with the End of Time (= end of precession cycle)! In Christian art, Christ is often depicted inside a ‘Vesica Pisces’ (representing birth) surrounded by the four beasts of the Apocalypse (representing the Galactic Cross). More surprisingly, often the eight-pointed cross, the wheel within a wheel is depicted as well! 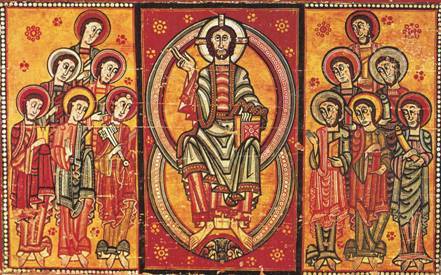 Art expressions like the one below are very common; and in many cases, either a four or eight-pointed cross is depicted on the book held in Jesus his hands! Christ inside the Vesica Pisces with an eight-pointed cross on the cover of the book. The twelve apostles esoterically refer to the twelve signs of the zodiac. There are eight pedaled ‘flowers’ all over the painting. 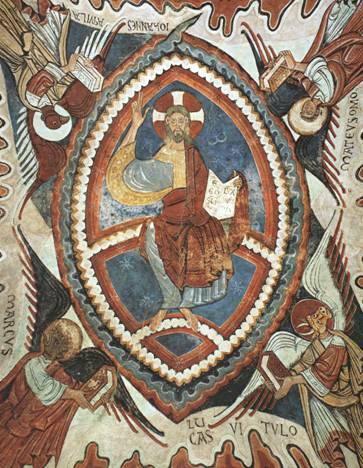 Christ surrounded by the four beasts of the Apocalypse, The eight-pointed crosses occur in abundance on the rim of and inside the Vesica Pisces. 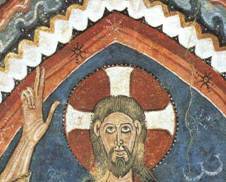 In all of these art expressions Christ always raises two fingers. What could be the meaning of these two fingers? Is he referring to the two twins Gemini which is his birth place in the precession cycle? Copyright © 2008 Aaron Parlier All rights reserved. Design by J. Bridges Design.